As IT Service Providers, we want to make things easy and understandable for our customers and users. Not only in terms of agreeing and delivering IT Services to them (to support the business outcomes they want to achieve), but also in terms of providing them clear channels if they want to approach us – or if we want to approach them. Customers: Sometimes being a representation of users, customers define how a service should look like, in terms of utility and warranty (e.g. SLA’s). Their counterpart can be Service Managers, Product/Service Owners or Project Managers. The Business Board. They give the overall direction to IT. Their counterparts on IT side are the Business Relationship Managers (BRMs). The BRM is the link between IT and business on a strategic and partially tactical level. Traditionally, IT always has been good in establishing the first two layers. However, IT often struggles with the BRM-layer, and not being perceived as a partner of the business. On the other hand, having an Account Management in place is common sense for external Service Providers (mainly outsourcers) since a while. So it is no surprise, that in ITIL™ Edition 2011 the discipline of Business Relationship Management finally has been introduced to follow the general trend of Business-IT Partnership. With the recent trend of CIO transforming to the ‘Chief Digital Officer’ (Driving new digital business ideas, which is much more than Business-IT Alignment), Business Relationship Management has even become more important. So, what are the key success factors in building up Business Relationship Management in your IT Department? In the following I would like to give you some tips, which I gained from recent real-live BRM-implementations. Who should own the BRM-discipline on IT side? Definitely the CIO. He should be the one driving forward the BRM discipline and BRM process, otherwise it will fail. And at the same time, the CIO is one of the BRMs, too. He is the BRM on top level, maintaining the relationship to the CEO and the management board. As a BRM, who do you want to talk to, who is the person (or persons), which represent your customer? Sometimes this is easy, in case you have only one internal customer and an established relationship. Most likely this is not the case and you even might have different regional, functional or product segments in the business. In this case it makes sense to ‘cluster’ the customers and be clear which BRM takes care of which cluster. For efficiency reasons, there should not be too many BRM’s. Don’t look at BRM only the traditional ITSM way (process-> role -> function), BRM is first of all about building a trust relationship with your business management. If building this relationship is not working on a personal level, you can forget all the rest. Besides knowing the business and IT, the BRM therefore should have the right ‘soft’ skills. All requests from the business to the BRMs should be maintained in a central BRM-register to keep track of them. The more internal customers you have, the more important this is (synergies/alignment). 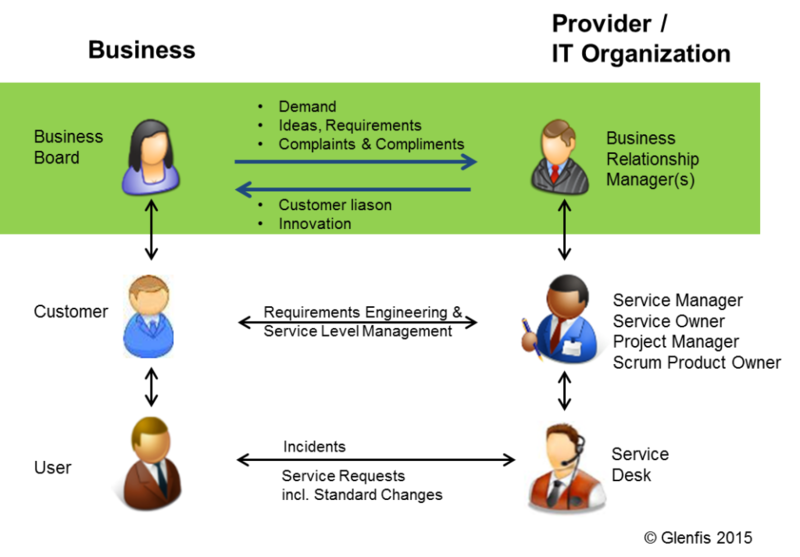 It also makes sense to differentiate between different kinds of request – for example: Complaints, demand or Ideas. Integration into other disciplines is key here. For example requests of the type ‘idea’, which are channeled through the BRM, might end up in a project request. Therefore you should define the interfaces to your Project Governance System. Or a business demand might have an input to Capacity Management. Besides regular meetings with the business there also should be regular internal BRM meetings to align the requests where necessary. For example, two customers with two different BRM’s might have similar requests. I hope this gave you some ideas on how the set up or improve your Business Relationship Management. Last but not least – don’t forget that this is not only about Business-IT Alignment (understanding what the business wants). This is more and more about actively bringing in new digital ideas into the business, building new digital business models and acting as an entrepreneur – and finally being in the business. Giro de Notícias - sua atualização semanal em TI - 1ª Edição (Checklist Big Data SMB, Google Kubernetes, Dicas Windows 10, Yahoo Livetext e mais!) - Tecnologia que Interessa!